We’d love your help. 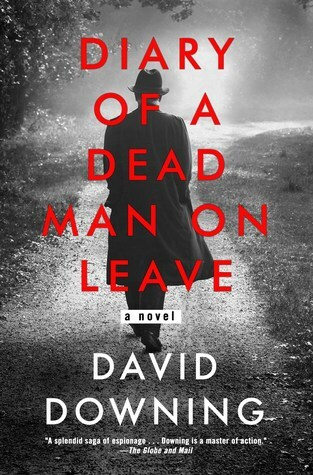 Let us know what’s wrong with this preview of Diary of a Dead Man on Leave by David Downing. In April 1938, a man calling himself Josef Hofmann arrives at a boarding house in Hamm, Germany, and lets a room from the widow who owns it. Fifty years later, Walter Ge From bestselling author David Downing, master of historical espionage, comes a heart-wrenching depiction of Germany in the days leading up to World War II and the difficult choices of one man of conviction. In April 1938, a man calling himself Josef Hofmann arrives at a boarding house in Hamm, Germany, and lets a room from the widow who owns it. Fifty years later, Walter Gersdorff, the widow’s son, who was eleven years old in the spring of 1938, discovers the carefully hidden diary the boarder had kept during his stay, even though he should never have written any of its contents down. To ask other readers questions about Diary of a Dead Man on Leave, please sign up. The exception that makes the dirge mood pile of current mounds of WWII era books look and read like the pap of sentimentality tracts which most of them are. IMHO, no one does the 20 years before Hitler within Germany as David Downing. This one isn't as Berlin identified as the Station books, nor is it as complex for length and intersects; but it's very nearly a 5 star book nevertheless. It's a full 4.5 stars. It's just the right length. Also holds one of those "afterwards" epilogue reviews as the The exception that makes the dirge mood pile of current mounds of WWII era books look and read like the pap of sentimentality tracts which most of them are. It's just the right length. Also holds one of those "afterwards" epilogue reviews as the ending which is looking back 50 years later with the "facts" of outcomes for a dozen or two individuals within the 1938 action. Dangerous, dangerous times to disagree with the "correct" values; and when individuals needed to exchange goods, duties, work etc. in some kind of equity while being told that "our values" toward collective progress are these exact sets of particular somethings. But within the individual's gut feelings for such exchanges which clearly conflict? Are you "allowed" to say your feelings aren't meshing with "our values"? And also in who/which of closest in-house associate and friendship might be paving the path to your relocation or to your seduction. Or both. For "our values" of positive enthusiasm. Who is a peer? Who is apolitical? Who is lovable? And far more than all of that, who is trustworthy to plain everyday conversations. Everyday life is particular of moment to moment placements in this household. The reader gets a seat in the boarding house at the dining room table for the breakfast meal, for the evening meal. You can feel the power threats, and the tension in the room. The attractions and the moods of personality too. And the 12 year old, Walter, is beyond finely drawn. He's a wonder. A spy story from the eyes of a Communist true believer written within his window pane hidden journal as it is lived. Narrator memories are as cutting and other continent nuanced as a non-fiction history. And beyond just ONE other continent- on 3 others. The brutality at "home" as ominous as the nebulous future of the next cell "boss" crossing. 1938 Nazi Germany through the eyes of a Communist? German born Josef (not his real name) arrives in small town Germany on behalf of the Communist Party’s Comintern (a real thing which I have only just learned). He has been sent to seek out and recruit other Communists to fight the Nazi regime. As much as I’m aware this is fiction (or is it?) the writing is such that I had the feeling I was reading non-fiction. Josef finds rooms in a boarding house run by a German woman with two sons and an elderly 1938 Nazi Germany through the eyes of a Communist? Josef finds rooms in a boarding house run by a German woman with two sons and an elderly father. There is also a cook, the cook’s son and three other boarders. Each character is very different and specific – each with a fascinating and interesting story of their own. I was drawn to each and every one, most especially 11-year old Walter. This is a compelling story written in a compelling manner with compelling characters. This is one of those ’can’t put down’ books. Obligatory disclaimer: I won a pre-release copy of this book in a giveaway here on Goodreads. This novel is presented as sort of an espionage story, and published by a crime fiction imprint, but it isn't really either. The protagonist is, of course, a spy, and there are many crimes (according to the laws of Nazi Germany) committed, but really it's mostly a drama set in 1938 Germany, whose protagonist happens to be a spy. It's pretty good, once you get used to this. There is, curiously, sort of a Y Obligatory disclaimer: I won a pre-release copy of this book in a giveaway here on Goodreads. There is, curiously, sort of a YA feel to this book; there's little swearing, no explicit sexual content, and only two scenes of explicit violence, which are shocking, pass quickly, and hammer home the cruelty and brutality of the Nazi regime, and the brutality it forced upon those determined to resist it. The other novel this reminds me of most, actually, is Number the Stars, which I had to read long ago in school, although this novel is somewhat more mature: whereas Number the Stars is an excellent book for elementary/middle schoolers, I think this'd be an excellent novel for high schoolers. The characters are generally effectively drawn and developed, but none of them are especially deeply delved into beyond the protagonist. Rather like a James Michener novel, each character serves as sort of a stand-in for an entire class of people in the difficult situation of having to survive under Hitler. There's the widowed mother who has to conceal her hatred of Nazism; her sons, the almost-adult boy who is part of an anti-Nazi youth gang, and a younger boy who is not overt in his resistance, but who is too perceptive and clever to be entirely taken in by the Nazi Party's propaganda; there's her father, the blinded old Great War veteran, who can speak his mind by virtue of having little to lose; there's the blithe middle-aged man who enthusiastically buys into the Party to compensate for his own very clear personal failings; the young man who buys into the Party because of the aimlessness he otherwise feels; the mother with a mixed-race child resulting from a brief romance with a black soldier serving in the French occupation after the war; and so on. The protagonist himself is very much the archetype of the jaded spy, and his character arc is one of slowly warming up as a person, and trying to reclaim his own humanity in a way; the novel is almost entirely in the form of his secret diary that he starts upon beginning his mission in Germany. Of course, this novel is set in Germany in 1938, so it does not take a genius to realize that few of these characters will find happy endings. As a book to be read, the writing is uniformly smooth and polished, if rarely sparkling or brilliant. It's a page-turner, and by the end I was almost rushing to the end to see what would happen to the characters (I already knew, of course, what happened to Germany). There aren't many cutting insights into life in Hitler's Germany, or life as a spy, or what it meant to be Stalin's puppet, but of course most cutting insights to be had have already been made in other books. Where this book excels is in creating an air of verisimilitude: how people live, what they think, what they eat, etc, all feel very real to the time and place depicted. Importantly as well, there's great effort put into making sure real events are documented as they happened in real life: since the novel is in the form of a diary with day-by-day entries, events like the second Louis-Schmeling fight, the Munich Agreement, and Kristallnacht are documented in real time, from the perspective of a person living through them. “Dead man on leave” is another name for an undercover Soviet spy. They don’t expect to live long lives as they live at risk of exposure at any moment. Josef Hofmann was such a man. Born in Germany, he was a fervent communist who was recruited as a spy years earlier and worked undercover in North and South America before returning to Germany as the Nazis were consolidating power. He moves into a boarding house and slowly into the lives of the family, drawn in by the intelligence and admiration of “Dead man on leave” is another name for an undercover Soviet spy. They don’t expect to live long lives as they live at risk of exposure at any moment. Josef Hofmann was such a man. Born in Germany, he was a fervent communist who was recruited as a spy years earlier and worked undercover in North and South America before returning to Germany as the Nazis were consolidating power. He moves into a boarding house and slowly into the lives of the family, drawn in by the intelligence and admiration of the youngest son, Walter. He keeps a hidden diary, one that won’t be found until the late 80s, a Diary of a Dead Man on Leave. He is at work at a trainyard looking for recruits and old connections, trying to identify who would be safe to form a cadre to carry out sabotage or terroristic attacks to weaken the Nazi military effort. While doing that, he is also helping with homework and family issues, falling in love, not with a woman, but with being part of a family of people he cares about and who care about him. David Downing is one of my favorite writers of World War II espionage. I loved the John Russell series. Diary of a Dead Man on Leave covers some of the same ground, but from a different perspective. It is, despite it being all about spying, less of an espionage story and more of a love story, though not a romance. This is the story of a man who comes to love a family, who feels a fatherly love for young Walter. The real conflict is between Josef’s work as a spy and his role in the family. I might have liked this book better without the contemporary epilogue that catches us up on what happened. It could have ended at the end of the final chapter back in the past. That would have been dramatic and we would have assumed the end anyway. The epilogue adds nothing we would not have inferred. Because it is exactly what we expected, it is anticlimactic and deflating. Diary of a Dead Man on Leave will be released April 2nd. I received an e-galley for review from the publisher through Edelweiss. I love this author! I have read all his "Station" books and this one lives up to those. A novel vehicle is employed - as a diary- for the story too. The protagonist, a German, is sent to a town in Eastern Germany to gather information for his bosses in Moscow. The long aim is to determine if certain railway workers are committed enough to Communist beliefs to set up a cell. This is what Josef does all over the world. He settles in a boarding house at his destination Hamm. The house is run by a w I love this author! I have read all his "Station" books and this one lives up to those. A novel vehicle is employed - as a diary- for the story too. The protagonist, a German, is sent to a town in Eastern Germany to gather information for his bosses in Moscow. The long aim is to determine if certain railway workers are committed enough to Communist beliefs to set up a cell. This is what Josef does all over the world. He settles in a boarding house at his destination Hamm. The house is run by a widow, her 12 year old son and her blind father. The borders are a motley lot - their characters are integrated well in the story, as are the family members. tone that the reader really gets to know the characters...ie. great character development! A close friendship develops between Josef and 12 year old precocious Walter. Throughout the story Hitler's power is rising and those living in Eastern Europe tremble at the thought of another war. Jews are being targeted more and more, Crystal Night occurs and railways assume a huge importance as the best way to supply and move troops. In 1938 a stranger shows up in Hamm, Germany under the name of Josef Hofmann, who is returning to his home town, looking for work in Hitler's Germany. In fact he is an agent of Comintern, a Soviet agency. His mission is near impossible, set up a communist resistance movement to sabotage rail lines of the Reich, before a war starts. Finding a home with a family named Gersdorff he finds himself getting deeply involved with the family, especially the family's twelve year old son Walter, who lost his In 1938 a stranger shows up in Hamm, Germany under the name of Josef Hofmann, who is returning to his home town, looking for work in Hitler's Germany. In fact he is an agent of Comintern, a Soviet agency. His mission is near impossible, set up a communist resistance movement to sabotage rail lines of the Reich, before a war starts. Finding a home with a family named Gersdorff he finds himself getting deeply involved with the family, especially the family's twelve year old son Walter, who lost his father years ago. As the book goes on Hoffmann's attempt to form a communist cell, become secondary to the trials of this family. The deeper he gets he must weigh his commitment to the 'cause' or protect the family which is rapidly falling apart. British author David Downing is the author of two series - one set in WW2 and the other set pre-WW1. I loved the first series - the "Berlin Train Station" (though the Prague station was stuck in there) - but didn't care for the second - the "Jack McColl" series. Now Downing returns with a standalone novel, "Diary of a Dead Man on Leave", set in pre-WW2 Germany. I don't think this is the start of another series. "Diary" is the diary of a Communist agent - Josef Hofmann - who has resettled in 1938 British author David Downing is the author of two series - one set in WW2 and the other set pre-WW1. I loved the first series - the "Berlin Train Station" (though the Prague station was stuck in there) - but didn't care for the second - the "Jack McColl" series. Now Downing returns with a standalone novel, "Diary of a Dead Man on Leave", set in pre-WW2 Germany. I don't think this is the start of another series. "Diary" is the diary of a Communist agent - Josef Hofmann - who has resettled in 1938 Germany. He'd been in South America, China, and other places for many years. He'd fought in the Great War but became a member of the Communist International in the post-war world. (Downing quotes Eugen Levine about Communist agents being "all dead men on leave.") He settles in Hamm, a small city in northern Germany, and hires on with the national railroad office. He's charged with talking to the workers - who many have anti-Nazi sympathies - on the feasibility of working against the Nazi regime. He boards at a house run by Anna Gersdorff - a widow with two sons. And so he goes about his business in infiltrating the railroad workers. He keeps a diary, which is the basis of the book. The problem I have with Downing's novel is the idea that an agent of a foreign government - particularly the Soviet government - would keep a diary of his activities. Sure, he has the diary in a secure hiding place while putting a dummy-copy in a "findable place" in case he's captured. I read Downing's novel with one part of my mind stretched a bit in incredulity. If you can get past that part, you'll enjoy the book. I'd have to say I did enjoy "Diary of a Dead Man on Leave", but wish it wasn't a bit unrealistic. His best by far. I would have given it five stars but sometimes the historical background bogged me down. Not always a fast or easy read. But very satisfying. One of the best books I've read in a while. A diary unearthed from the ruins.. The diary finding its way back to light the way for one of the survivors and this very interesting window into past history. I enjoyed this book, it’s outside my usual genre for sure! It was well written, but not a subject I’m familiar with. I ended up looking several things on my phone while reading it so it was a slow read for me. But I liked the characters and it had a satisfying ending! David Downing is the author of a political thriller, two alternative histories and a number of books on military and political history and other subjects as diverse as Neil Young and Russian Football.